During the last couple of years, synthetic procedures for the production of electrochemically synthesized nanowires have been developed in the Inorganic Materials Science lab. Via this very cheap and simple method, billions of free-standing metal (Au, Ni, Ag, Sn, Pt) and metal oxide (ZnO, Ag7NO11) nanowires with a diameter of 50-300 nm and a length of 4-6 µm can be synthesized inside the pores of PCTE and AAO membranes; see Figure 1 for a SEM image of a cluster of nickel nanowires. Next to the synthesis of nanowires, also Fe2O3 nanotubes can be synthesized inside these membrane pores via a simple electrochemically induced sol-gel method. Via this method, an iron hydroxide gel is formed inside the membrane pores and during the drying step this iron hydroxide gel is converted to iron oxide which sticks to the sides of the membrane pores. 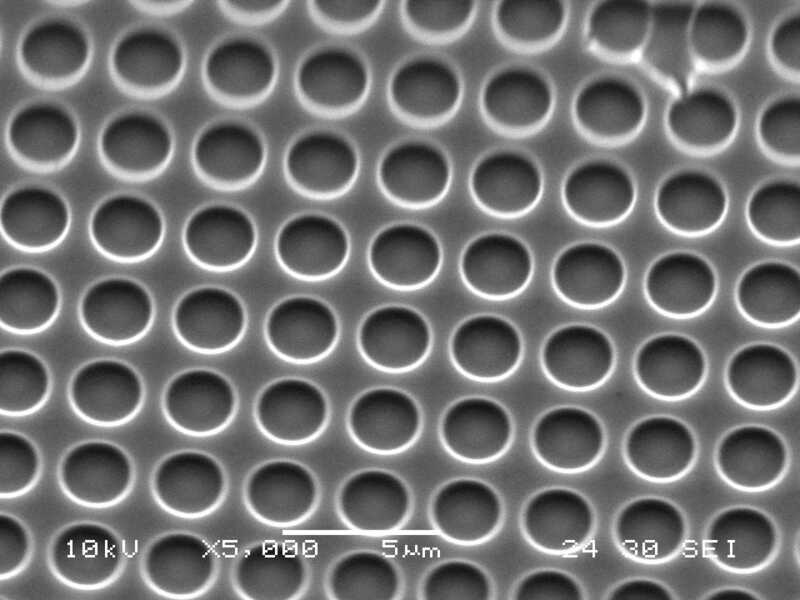 This templated electrodeposition technique for the production of nanowires and nanotubes could also be used for the synthesis of larger line patterns by using a PDMS mold pressed on a silicon substrate as the template instead of membrane pores. One of the challenges to realize new types of devices based on these nanowires and nanotubes concerns the controllability of the orientation and position of the formed nanowires.Recently, a first step towards full controllability of these nanowires by aligning them in between pre-patterned electrodes has been made. By using dielectrophoresis, all kinds of nanowires could be aligned in between the electrodes. During the next step, these nanowires will be coupled to the edges of nanocubes (see Figure 2 for a SEM image of a cluster of silver nanocubes ) in order to form a large open ordered cubic mesostructure. Before this can be accomplished, well-defined nanocubes and nanowires with a small size-distribution need to be formed. Another application for these nanowires is the photocatalytic production of hydrogen from a mixture of methanol and water. This is carried out with the use of segmented Ag|ZnO nanowires. Using a hydrogen sensor, hydrogen formation was recently proofed and current investigations focus on the production of segmented Ag|TiO2 nanowires to improve the timescale of hydrogen formation.